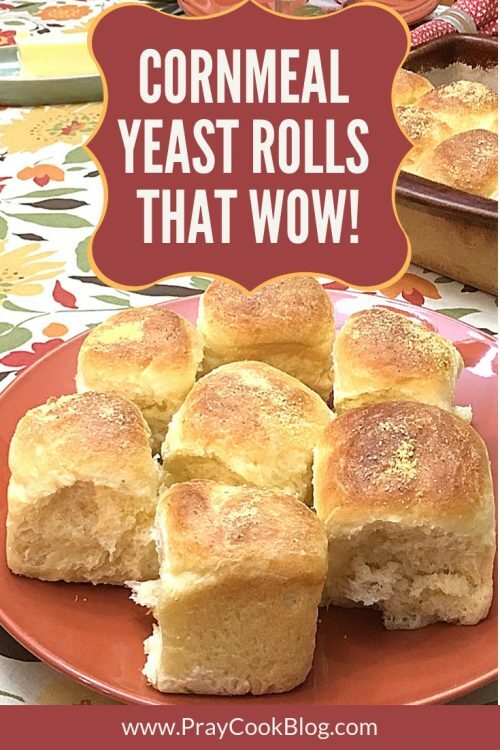 Don’t let the “yeast” part of these rolls intimidate you or stop you from making them. 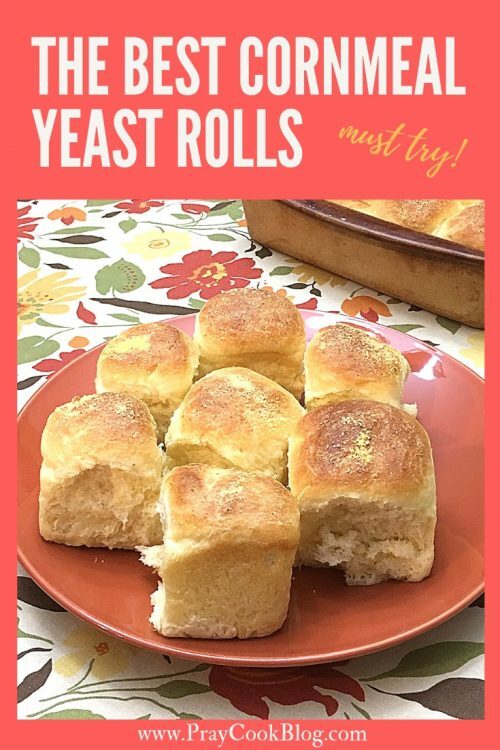 They are very straightforward, easy steps and the flavor is better than any other yeast roll that I have made. The milk, sugar, and cornmeal cook together to make a lovely mixture that is actually quite tasty on its own! Yes, I did give it a try! I prefer to taste as I cook! 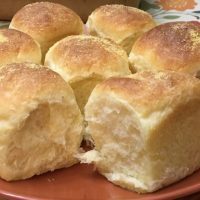 Forty years ago my friend Sue told me about “cornmeal” rolls. Sue taught me lots of great things about food and sometimes life in general! 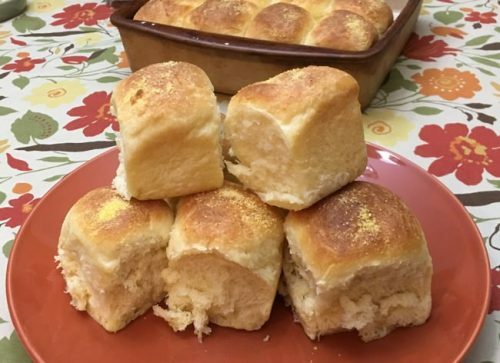 These cornmeal yeast rolls have been a staple in my recipe box from the first time we made them. This week I was making bean soup and I would normally have made cornbread to go along with this light supper. But the weather was dreary, cold and a bit rainy and so the fragrance of bread dough rising in my kitchen was exactly what I needed to go along with the soup simmering on the stove! These cornmeal yeast rolls are fool-proof and so delicious. With Thanksgiving around the corner, you just may want to give them a try. You can also cool them well and put in an airtight container in the freezer until you need them. Enjoy! In a medium-sized saucepan, combine the milk, sugar, butter, cornmeal, and salt. Reduce heat; cook and stir until thickened, 5-7 minutes. Cool mixture to no hotter than 110° - 115°. Be sure and test the temperature with an instant-read thermometer. If the temperature is too hot it will kill the yeast when you add it. In a large bowl, (electric mixer with the dough hook works well) combine the cornmeal mixture, yeast mixture eggs, and 2 cups flour; beat until smooth. Turn onto a floured surface; knead until smooth and elastic, 6-8 minutes. Place in a greased bowl. Cover with plastic wrap; let rise in a warm place until doubled, about 1 hour. If you have a mixer that will mix and knead the dough, just continue to mix adding small amounts of flour until the dough turns from sticky to soft instead of kneading by hand. Punch dough down. Turn onto a lightly floured surface; divide into 32 balls. Place 1 in. apart on greased baking sheets or in a baking dish. Cover with towel or plastic; let rise in a warm place until doubled, about 45 minutes. If the kitchen is warm this won’t take as long. 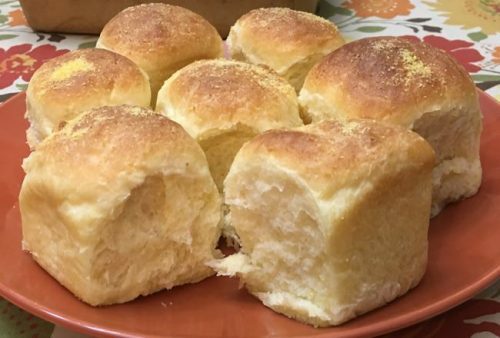 Uncover rolls; brush with melted butter and sprinkle with cornmeal. Bake at 375° until golden brown, 15-18 minutes. Remove from pans to wire racks; serve warm with butter!